The No. 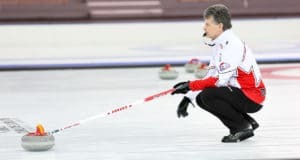 2-ranked team on the Canadian Team Ranking System, Epping, vice-skip Mat Camm, second Brent Laing, lead Craig Savill and coach Jim Wilson were stung 7-2 by reigning Tim Hortons Brier champion Brad Gushue of St. John’s in the morning draw and then dropped a tough 8-6 decision to Kevin Koe of Calgary (2-1) in the afternoon draw at Affinity Place. Koe and lead Ben Hebert, with newcomers B.J. Neufeld at third and Colton Flasch at second, lead the CTRS standings and jumped into an early lead against Epping. Koe scored three in the first end and two in the fourth for a 5-1 margin. 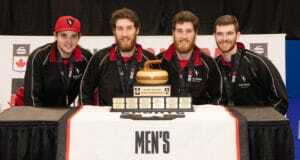 But unlike in the morning draw when Epping conceded early against Team Gushue, the Ontario foursome hung in and made it interesting against Koe. Epping and Co. scored singles in the second and fifth ends and got a deuce in seven to cut Koe’s lead to 6-4. Epping got another deuce in nine but Koe made the last-rock draw he had to in 10 for the win. Despite the loss Epping said the fact his team “battled back, battled hard, finished strong” is a positive moving forward. In the other men’s games, Brad Jacobs of Sault. Ste. Marie, Ont. 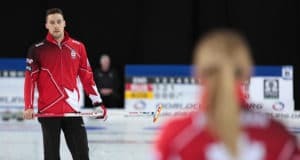 (4-0) beat Matt Dunstone of Regina (0-3) 7-4 while in a rematch of last season’s Tim Hortons Brier final won by Gushue (2-2), Brendan Bottcher of Edmonton (2-1) emerged victorious 9-8. The win by Jacobs guarantees his team at minimum a tiebreaker game. On the women’s side Chelsea Carey of Calgary (2-2) beat Alli Flaxey of Winnipeg (1-2) 7-5 while Laura Walker of Edmonton (1-3) scored four in the 10th end to beat Darcy Robertson of Winnipeg (1-2) 8-5. The 2018 Home Hardware Canada Cup continues with tonight’s draw at 7 p.m. CST.